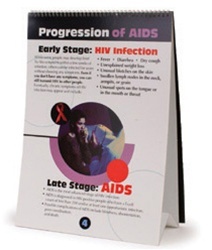 Ideal for students and patients, this flip chart provides valuable information about what HIV/AIDS is, its symptoms, how it is transmitted, how it can be avoided, and how it weakens the immune system. Features presenter's notes on reverse panels. 6 panels, 12" x 17".